I tried to install MSE and it said an error has prevented the setup wizard. So I guess I should put AVG back on. 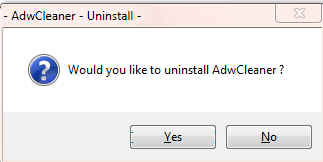 I can't install AVG either. It comes up with that WIndows Installer service could not be accessed and that same error code 0xC0070643. Edited by tuffstuff, 05 June 2013 - 01:47 PM. Have you been getting any notifications from Windows Updates when new updates are available? Or have new updates been automatically downloading and installing? When was the last time you got a Windows update? I think I have had one update since this all has happened. I looked and automatic updates is on. I can't tell if the AVG installation problem is due to an issue with AVG or an issue with the Windows Installer. Most of the information I've seen on that error code is related to an installation problem with AVG after uninstalling an AVG product. So we are gonna see if we can identify the problem. Microsoft came out with a neat little program for use with XP and down called Windows Installer Cleanup. It was taken off of the Microsoft web site after Vista came out because it wasn't compatible with Vista and up but people kept trying to use it so Microsoft pulled it. My thinking here is that if the Windows Installer CleanUp utility installs then the problem is with the AVG uninstallation/installation and after the Installer CleanUp is run we will have a list of the programs registered to Windows Installer. Double click the msicuu2 folder to open it and then double click the msicuu2.exe file to install the program. By default, the setup program installs the Windows Installer Clean Up Utility files to a folder beneath the Program Files folder. This folder is called "Windows Installer Clean Up." All the files that are used by the utility (Msicuu.exe, Msizap.exe, and a Readme file) are copied into this folder, and a shortcut is created on the Programs menu under the Start menu. Click Start, point to All Programs > Windows Installer Cleanup and double click the msicuu.exe file to run the program. A dialog box will be displayed that contains a message, a list of installed products, and four buttons. The list contains the titles of all the installed programs that are registered with Windows Installer. 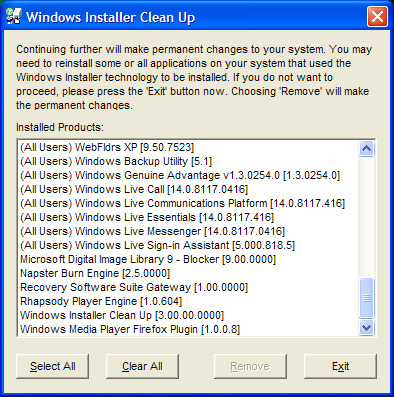 Because the Windows Installer Clean Up Utility installation also uses Windows Installer, the Windows Installer Clean Up Utility should be included in the list. When you have the screen up that you want to capture...click on the ALT key + PRT SCR key. This will put the screen shot in the clipboard. Click on Start>> All Programs>> Accessories>> Paint. A Paint window will open up. Left click in the white area and press the CTRL + V keys. This will paste the screen shot from the clipboard into the Paint window. On the Menu bar at the top of the Paint window, click on File, click on Save and save it to your desktop. In the Save as type: box, BE SURE TO SAVE IT AS A .JPG ...otherwise it may be to big to upload. Back in the Windows Installer Cleanup program, click the Exit button to close the program. Upload the screen shot into your next reply. To do that see the link below. To upload the screen shot and put it in a post, click on this link for directions. The windows installer could not be accessed. That is the message I got when trying to run msicuu. OK. So now it appears that the Windows Installer isn't working. It seems like we take one step forward and two steps back. Nothing that we have done should have broken the XP search feature or the Windows Installer. We are gonna run a tool and see if we can repair these but I've gotta tell you, if things keep breaking you are eventually looking at reinstalling the XP operating system. [*] Once the new restore point has been created, close System Restore[/list]Step-2. Make sure all of the items are checked like the image below and in the lower right corner tick Restart system when finished. Then click the Start button. Both of these repairs will take a little bit to complete, depending on the speed of the system, the number of files and the number of reg keys. On a few systems it is possible for these repairs to get stuck in an infinite loop and thus never complete. This is because of symbolic links. Symbolic links are a way for a folder or reg key to point to a different location. On a normal system this isn't a problem. But if a system has a bad link that points back to a parent path then everything it hits in that link it will hit it again and again forever. If the repairs are running for a insane amount of time then they are most likely stuck in a loop. If that is the case stop the repairs. Then run Windows Repair again (without doing Step 3.) and uncheck the boxes beside Reset Registry Permissions and Reset File Permissions before running it..
After the Windows Repair has run see if you can install the Windows Installer CleanUp utility. Everything worked. I have attached the screenshot. I hope it is correct. I see a black box instead of an attachment. I clicked browse and attach. If you click on the black box it opens. Now do I try to reinstall MSE or AVG? If it's AVG does it install the toolbar, should I not install that? Edited by tuffstuff, 06 June 2013 - 08:52 PM. I'm glad it worked. The first thing I want you to do is run the Windows Installer Clean Up utility again and look for anything in the Installed Products list that says AVG or AVG Security Toolbar or MSSE or Microsoft Security Essentials. If you find any of them, click on the program to highlight it and then click the Remove button. Do this for each AVG or Microsoft Security Essentials program in the list. Then first try to install the MSSE. If that won't install then try AVG. I see nothing for AVG or MSE in the Windows. Will try to install the MSE first and then AVG. MSE installed, updated and is doing a scan. Couldn't get on here most of the morning. As I said MSE is installed and the internet has been on and working all morning. My search feature for files is working again also. I am only wondering about SP3 having only remnants left and not the full version. Edited by tuffstuff, 07 June 2013 - 08:48 AM. All of that is good news indeed. If MSE installed and the system is stable now I would tend to think that SP3 is installed but for some reason doesn't show in the list of updates in the Control Pane. Have you checked the list of installed updates in the Add/Remove programs to see if SP3 now shows? At any rate, if everything is working I would be inclined to leave well enough alone. I want you to get me a fresh OTL scan just to make sure all is clear. Then we will remove all of the tools we have used. In the mean time I will get a Tech to go through this thread and see if there is anything that he would recommend for the SP3 issue. Please open OTL and click the Run Scan button and post the OTL.txt log. I don't see anything related to SP3 in my control panel programs. For the OTL scan do I have to check anything specific in the boxes before I hit run scan? Nope, just click the Run Scan button and post the log. Computer Name: DEBEVE | User Name: Owner | Logged in as Administrator. The good news is I don't see anything in the last OTL log. If you are a happy camper and there are no other issues, other than the SP3 issue I am checking with the Techs on please let me know you have read the cleanup instructions below and I will leave this topic open till I hear from the Techs about the SP3 issue. OK! Well done. Here is the best part of the process! The mullygrubs are gone! That's a technical term for your log(s) appear to be clean! If you have no further issues with your computer, please proceed with the housekeeping procedures outlined below. Click Start then Run. This will display the Run dialogue box . 1. Please re-open on your desktop. NOTE: You can keep the Uninstall CleanUp Utility and Windows Repair All-In-One programs if you wish but unless you are sure that you know how to use them I would recommend that you uninstall them from the Add/Remove Programs in the Conteol Panel. [*] Close System Restore[/list]Turn OFF System Restore. SpywareGuard-to catch and block spyware before it can execute. A tutorial can be found here. well I deleted everything except I couldn't find Eset scanner in my programs. I started updating everything and then I added the No scrip and web of trust. I am already set on automatic updates, so didn't need to do that. There is a single update in my taskbar I installed it and it still pops up after restarting my computer and it is the same single update. KB2538242 C++ 2005 SP1 redistributable package. Now the computer hung up again and I had to restart. It worked all day. Could it be the addons? Everything was working great. It is lasting less than 5 minutes. All day and I was very hopeful. Did everything except: Started hanging up after everything else. This time when I restarted, MSE came up not started at risk with an X over the little icon on the taskbar. I hit restart on it and nothing happens. So I am not protected. What is going? Should I do a system restore and see what happens. I only have two restore points at 3:05 and 3:06 pm. The 3:06 pm says software distribution 3.0. The other was just a system checkpoint. Okay left the room for an hour and now MSE is working. Weird. Edited by tuffstuff, 07 June 2013 - 05:53 PM.